It was a few days after the average date (we had a blissful week of Indian Summer), but the first frost finally hit the NYC area a few days ago. Luckily, my attentive boyfriend paid more attention to the week's weather forecast than I did and alerted me to the fact that I had about four hours to remove all signs of life from the balcony, lest I lose five months of moderately time-consuming work. At this point in the season, I had one small planter each of oregano, basil, and chives, and four tomatoes total - one that was ready for picking, and three that showed up late to the party but so eagerly wearing party dresses that I couldn't turn them away. 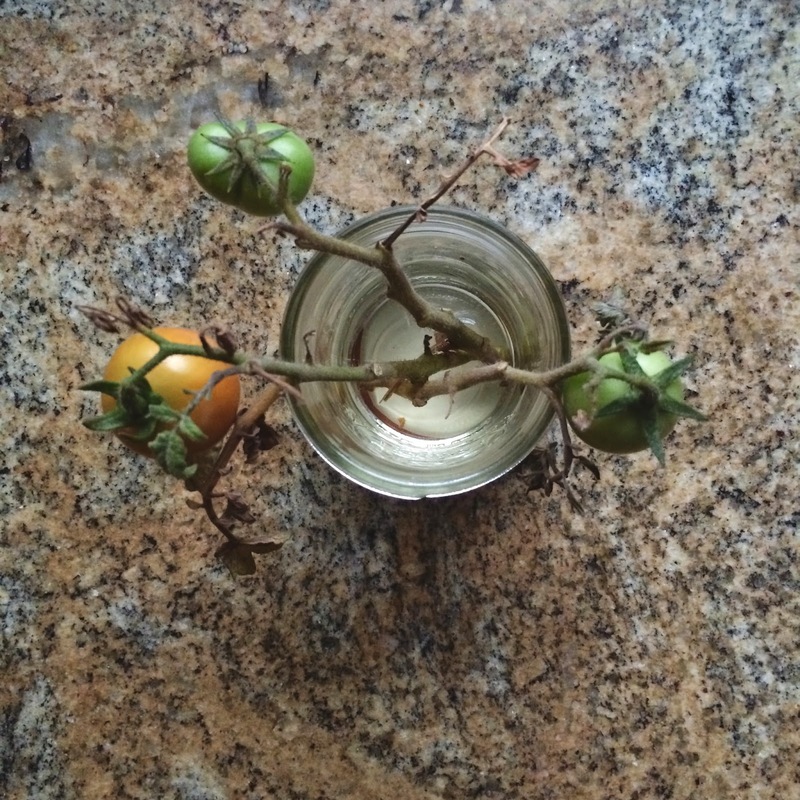 I tackled the tomatoes first - the red guy joined his previously picked bother on a most wonderful turkey and cheese sandwich, and the three unripe tomatoes got cut and placed in a jar of water. 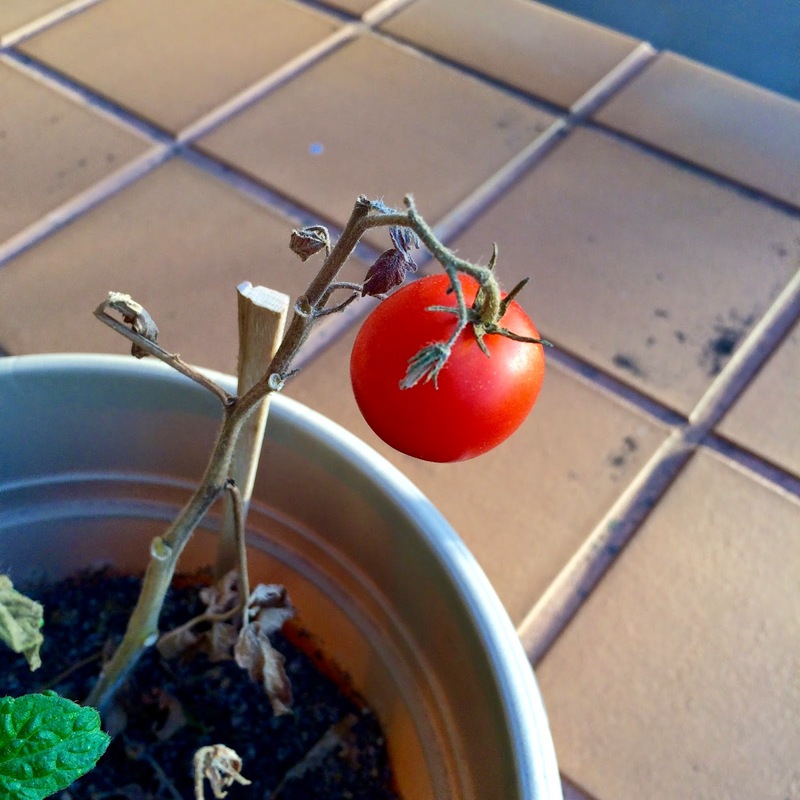 Disclaimer: I have no idea if that's what I was supposed to do with the unripe tomatoes, but it's been two days now and they are slowly turning from green to red, so I guess it's working(?). Now, for the herbs: All three varieties were still doing pretty well, so I knew I wanted to save as much as possible. 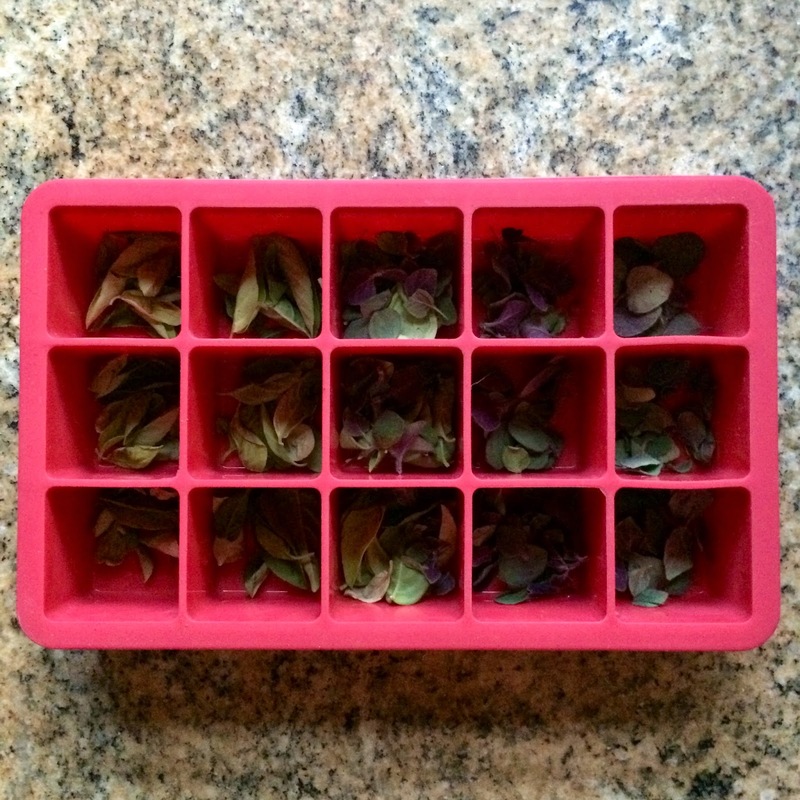 I had read a handful of articles suggesting that I freeze some of them in olive oil, so I did just that - I picked and washed the oregano and basil, and placed a small palmful of each (roughly the amount I'd use in any one dish) in the cups of an ice cube tray; three "cubes" got both herbs, in case I feel like using a oregano/basil blend (pasta sauce, anyone?). 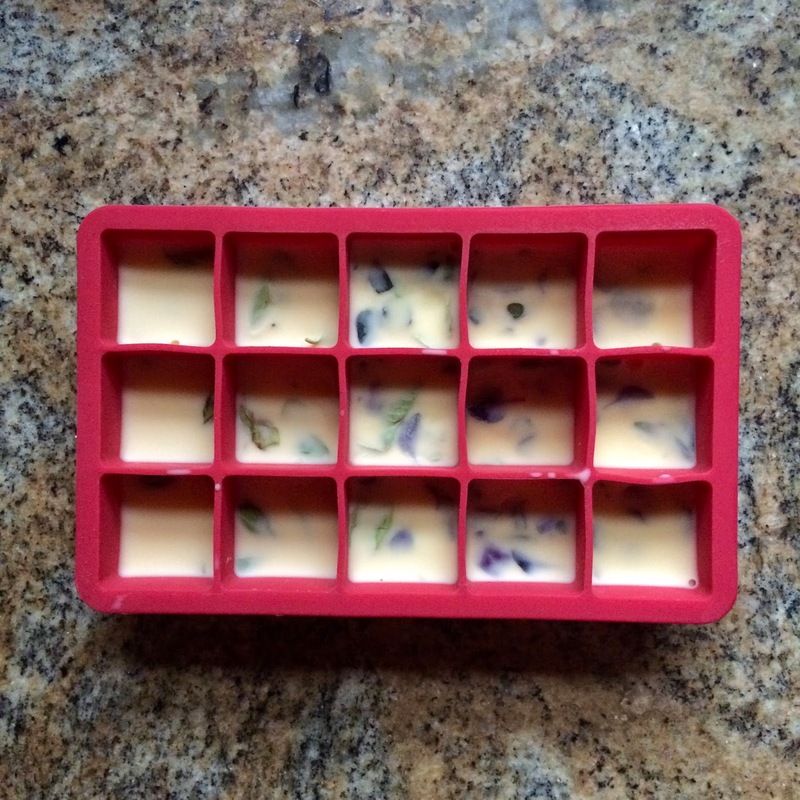 Then I filled each well 3/4 of the way with olive oil and placed the entire tray in the freezer. 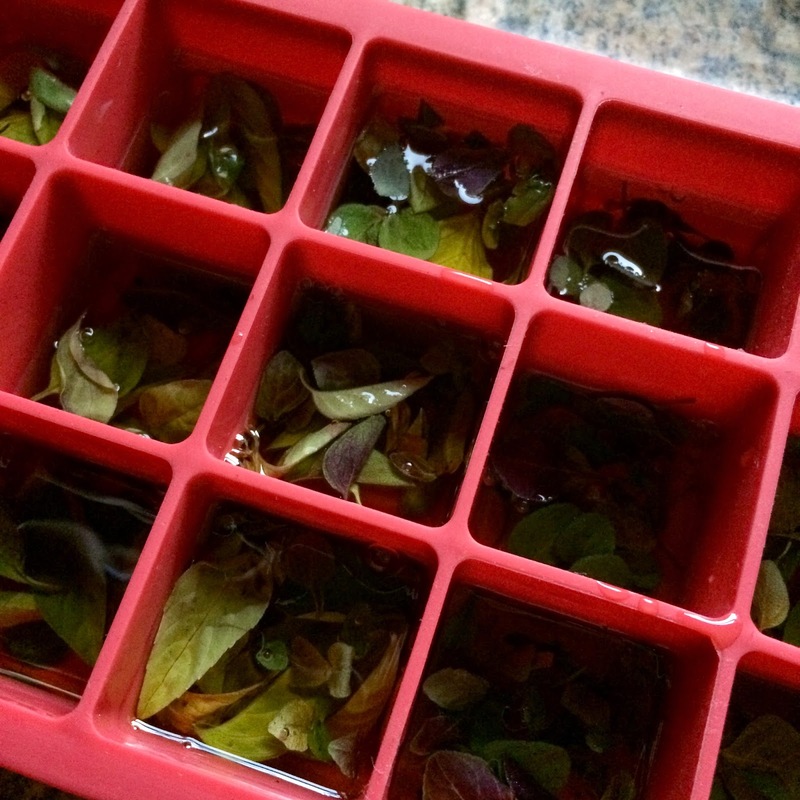 If I want fresh oregano or basil any time this winter, in theory all I have to do it throw the entire oil cube into a sauté pan along with any other vegetables I'm choosing to add to the dish. I decided to try something else with the chives since I usually add them fresh to a meal instead of sautéing first. 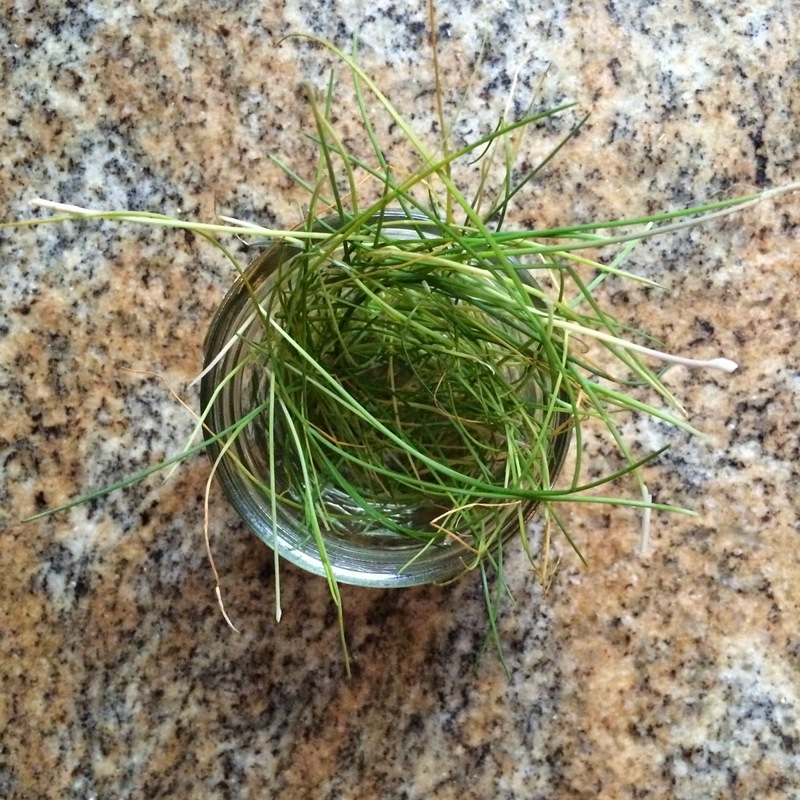 So I simply cut the chives at their base (I felt like I was giving the entire plant a hair cut) and placed them in an empty jar. I'm kind of shooting in the dark with this one, but my plan is to let them completely dry out and then either finely chop or grind them into a powder, and sprinkle that over my food whenever I feel it needs a chive-y kick (baked potatoes? popcorn?? the possibilities are endless). This was my first time ever attempting to grow something other than a few (unsuccessful) bamboo plants in my college dorm room and one (equally unsuccessful) succulent in my first New York apartment. And honestly, I was pretty nervous. 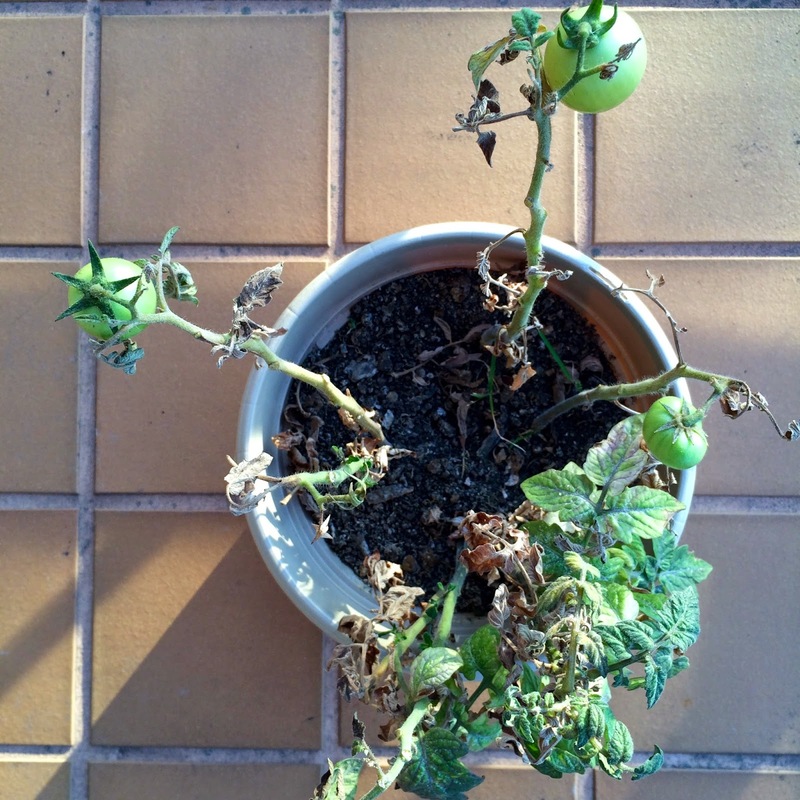 I was worried that nothing would grow and that all my effort would be for naught - but after a couple of pep talks from various green thumbs, I turned my visions of a thriving balcony garden into a pretty decent reality. 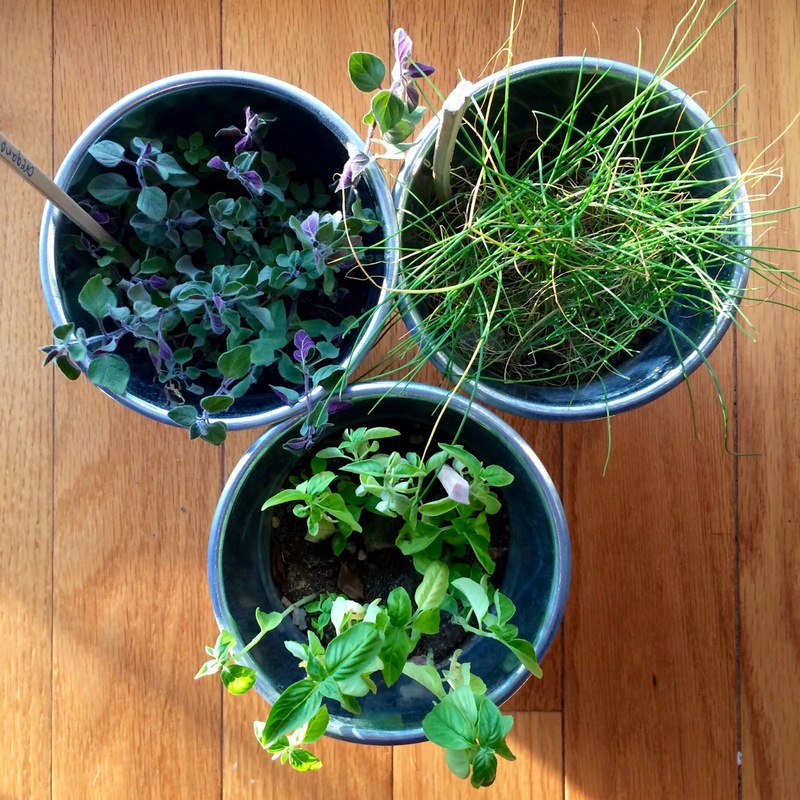 After all was said and done I netted a small planter each of oregano, basil, and chives, and 6 (and counting!) cherry tomatoes. The eggplant though, I regret to inform you, was not as successful. I kept waiting for it to turn from a bright to a dark purple like I'd read on various gardening websites, but instead it went from bright purple to a sallow green. I don't know if I did something wrong other than not pick it at the correct time, but it ultimately was inedible. The succulents, I'm happy to report, are thriving. Maybe it's their placement on a well-lit window sill, or maybe it's the fact that for the first time in a decade I can control the temperature in my dwelling and therefore aren't living in an igloo five months out of the year, but my five little succulents grew into six after a successful propagation, and at least four of them are due for a serious repotting sometime soon. So was it worth it? YES. I grew to love saying "good morning" as I watered them each day, and what became a ritual of going outside a few times a day provided an unexpected comfort and joy within me. Also, watching something grow from nothing into something is simply pretty cool. I'm almost certain I'll be in this same apartment next summer (not always a given in my freelance lifestyle) and I'll definitely be instituting Balcony Garden 2.0, but focusing more on herbs than vegetables. Growing tomatoes was fun, but one handful of cherry tomatoes in September doesn't actually help me out in any true culinary sense. 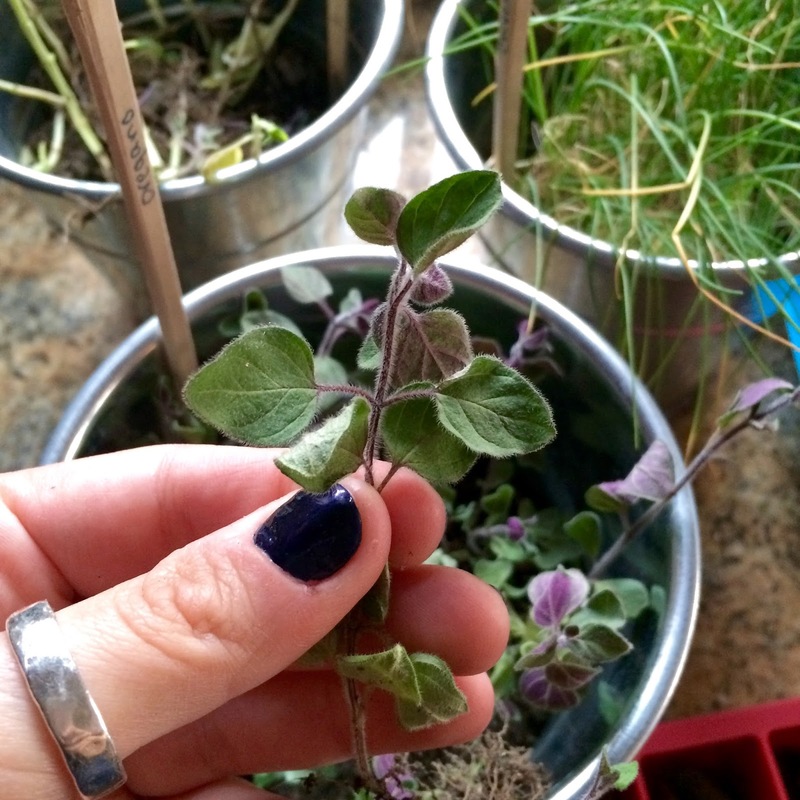 The herbs, on the other hand, were so quick to grow (and grow, and grow) that I was able to begin incorporating them into my cooking by early June, and being able to walk the fifteen feet from my kitchen to my balcony to grab fresh herbs whenever I wanted was one of the highlights of my summer.